Never let it be said Kylie Jenner isn’t extra. The proud mom chose to celebrate the first birthday of Stormi, her daughter with Travis Scott, by creating a lavish “Stormiworld” bash, complete with a gigantic image of her daughter’s face. TMZ reports Kylie rented the entire backlot of Universal Studios, packing it with carnival rides, including a Butterfly Rainbow Forest and a Baby Shark station. The party reportedly featured yummy goodies like soft pretzels, lemonade, and pizza, plus a boutique dubbed Stormi’s Shop, where guests could get merch branded to the occasion. TMZ points out that the girl who has everything and then some received even more, in the form of such over-the-top gifts as a Chael bag from DJ Khaled. 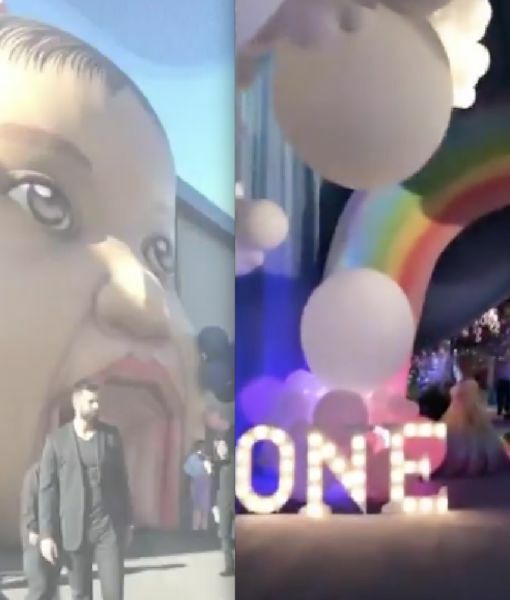 Stormi turned 1 on February 1 and was already celebrated at a modest rainbow-themed party last weekend — but this party seems to have been the pot of gold at the end of it.